The experience of a Luxury Safari in South Africa and meeting the Big Five in the epitome of luxury, is the ultimate in African wildlife experiences. But what is a luxury safari?, one might ask. One person's idea of luxury can be quite different from what the next person thinks it is. As we said before, it all a depends on your desires and preferences. The picture and video galleries at the bottom of this page are there to help you visualize the concept of luxury on an African safari. Whatever type of safari you choose, the objective is the same and that is to explore and enjoy the African wildlife and scenery with as ultimate goal a Big Five encounter. To do so in the epitome of luxury takes this experience one step further. Whether you stay in a lodge or in a safari tent, the quality of the accommodation and service will be on par with, and often even better than, any of the international 5-star hotels and chains. The bedrooms are comfortably furnished, have en suite bathrooms and are fitted with state of the art amenities such as air conditioning, private dining, well stocked bar, private decks with plunge pools overlooking a river or water hole and many more. Many of these luxury African safari lodges also offer spa treatments so that you can relax and unwind while surrounded by the beauty of the African bush. 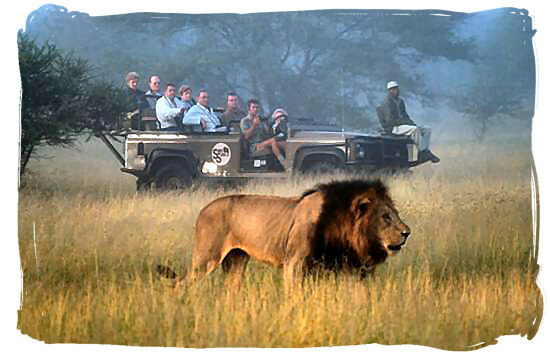 Most luxury safaris in South Africa are offered and organized by private game reserves. It is mainly them that have the resources and expertise to provide this exquisite level of luxury and professionalism. The game viewing and wildlife experiences they offer are extraordinary. Their game rangers and guides are both highly knowledgeable and passionate about wildlife conservation, ranking among the best in the business. On morning, afternoon and nightly game drives they will guide you to amazing wildlife encounters. Because they know with the aid of skilled trackers where the animals move around and are to be found, the success rate of extraordinary sightings and experiences is very high. In between game drives you can luxuriate in all the amenities of the Lodge such as enjoying a delicious brunch and taking a siesta afterwards, or relaxing at the pool side. It is early morning. Imagine yourself in the middle of the African bush, sitting on your private veranda overlooking a water hole, the sun rising slowly over the horizon, casting its pinkish-orange glow over the wraiths of cloud. All around you is the sound of sunrise bird song, in your hands a steaming mug of coffee, and then you hear a rustling sound. It comes from across the water hole, something is stirring the bushes. A giant shape comes into view, and another one and still another one, a whole herd of elephants, all of them thirsty and looking for water. 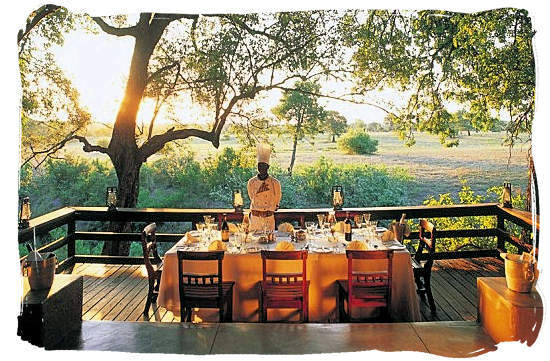 While you are watching them play in the water hole, one of the Lodge's servants is serving you a delicious breakfast. You have to eat fast, because it is almost time for the morning game drive to get underway, The ranger and his tracker are already walking to their vehicle. That was the start of a glorious luxury safari day in one of South Africa's private game reserves, with everyone full of exited anticipation of the awesome wildlife encounters awaiting them. Find the luxury safari that best suits your interests and preferences. Use the comparison guides below to compare and evaluate over 50 major wildlife parks and reserves, over 500 safari tour operators and over 450 safari tours in South Africa and find the one that will match your criteria as best as possible. Lunch is ready at Selati camp in the luxury Sabi Sabi private game reserve. Selati camp is one of the four luxurious bush camps and lodges in this world-renown African wild life reserve which is situated adjacent to the Kruger National Park in South Africa. Herd of Giraffes on the run. 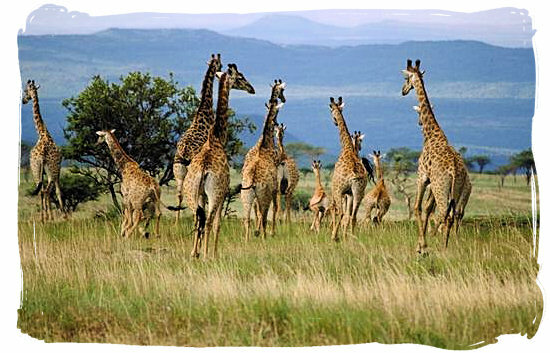 Giraffes can run quite fast, reaching speeds of up to 56 kph (35 mph). They move in a typical way, much like a horse's gait. Both the front and back legs on one side move forward together, then the pair on the other side and so on. This is called pacing. When they run it is almost like a gallop. 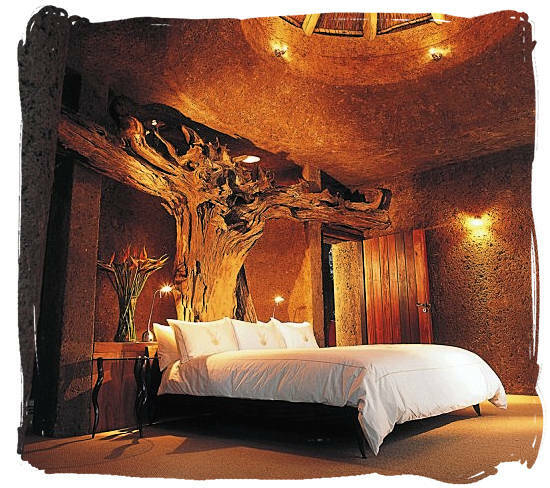 The Amber suite at the Earth Lodge in the luxury Sabi Sabi private game reserve. Also called the presidential suite, it is the ultimate in luxury, indulgence, elegance and sophistication, including a private dining facility, private pool, and private game drive crew and vehicle. It comprises a double bedroom with magnificent carved wooden headboard; en suite bathroom with huge, egg-shaped stone bath; study, steam room, kitchen and dining area. Lion encounter in the luxury Sabi Sabi game reserve. To watch a fully grown black-mane male lion patrolling its territory is an awesome experience. Lion population numbers have declined to an alarming extend from a population of around 400,000 in the 1950s to about 30,000 today. So, cherish your game drive Lion encounters because we do not know how long these great animals will still be with us. Sabi Sabi Selati Camp, Bush Lodge, Little Bush Camp and Earth Lodge are some of the most well-known luxury bush lodges in the Sabi Sabi Sands Private Game Reserve region. It is situated in South Africa adjacent to the Kruger National Park without any fences between the two of them. Home to the "Big Five" (Elephant, Rhino, Lion, Leopard and Buffalo) it is a true world-class luxury African safari destination for those who like to indulge themselves in delicious cuisine, luxury accommodation and personal service together with exceptional bushveld experiences and breathtaking wildlife encounters.